This is a short story before my story. Cut to around thirty years ago. I was a regional manager/salesman for Luxottica Group, the world’s leading eyewear company. One of my favorite eyeglass accounts was George DuBois, optician extraordinaire and humanist. He employed a teenage student from across the street, Laurie Zaleski, as an optical technician. That’s the beginning of my story. I left the optical business ten years ago and drifted out of touch with George and Laurie who was working with the FAA in graphic design. Over the years, an occasional email dealing with current events arrived from George. A few weeks ago, I saw the Funny Farm Rescue Facebook page. 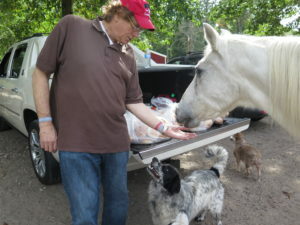 I mentioned to George in an email, that I haven’t eaten anything with four legs since 1975 and everything Laurie (and you) are doing to care for abandoned, sick animals is so meaningful. 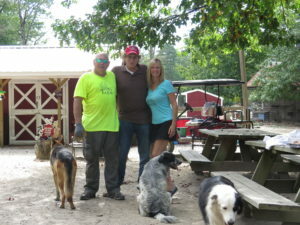 It hit me; I needed to do an NJ Discover story on Laurie and the farm and get a chance to see them both after so many years. 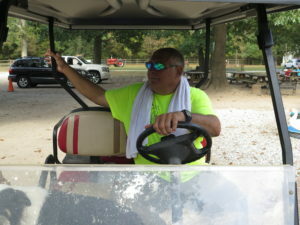 Two weeks ago, I drove down to May’s Landing with two GPS systems to help my navigation. I was going to deep south Jersey where they still have general stores and on a relief map, it’s actually not that far from the Mason-Dixon Line. It’s October and there is supposed to be a chill in the air. It was in the low eighties with a cloudless blue sky. One GPS told me to make a left, the Google Maps told me right turn. It was right as I pulled into the farm complex of 20 acres. 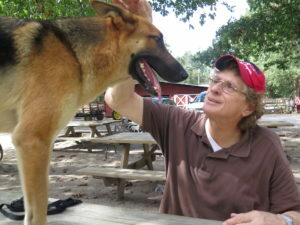 I hugged George and Laurie while several dogs gathered around. We sat at a picnic bench; my yellow legal pad primed. Many years ago, Laurie’s mother rented a house across the street from George’s optical store and when she was a young teenager, started working for him; filing and miscellany. “My mom worked for animal control so we always had animals. 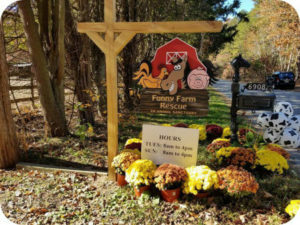 She rented that house for 20 years and when she died, I bought this farm and moved here in 2000.” At the time, Laurie had a graphic design and photography business and works for the FAA as an outside contractor for the past 27 years. To add to her fascinating persona, she has a pilot license. 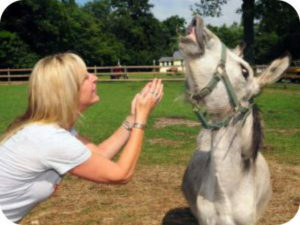 The thought occurred to me, that a main thrust of this article should be reaching out to our NJ Discover audience and encourage you all to donate something, anything to help Laurie and company care for these precious 500 animals. There was a lot of love and devotion coming across; it’s so easy to see and feel. Laurie was replete with a refreshing genuineness. 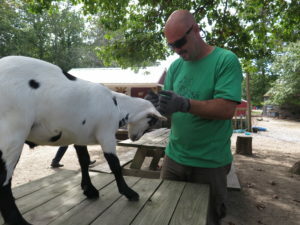 All of a sudden, a small black and white goat jumped onto the table top. 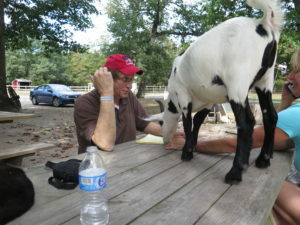 She hugged him and in a flash the goat was munching on my yellow legal pad. It was a scene perhaps from the ‘Sound of Music.’ (The Lonely Goatherd). 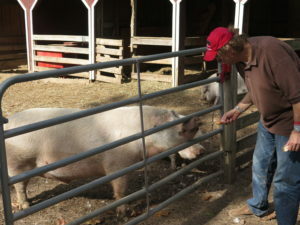 Laurie explained that there is no politics on the farm. “Just be kind to the animals.” She talked about some dealings with the local vegans, about their complaining that she had leather seats in her car. “I’m a vegetarian, different from being a vegan.” I told her about my being a flexitarian since 1975. I eat nothing with four legs, but do eat chicken, turkey and fish. I’m not perfect yet. “My mission is not to change you into a vegan. Be kind to animals. She told me about a little girl who came to the farm, held a baby chick and then told her mother she’ll never eat chicken again. My mind was swimming in thoughts about writing this article and continuing to spread the word about all the goodness and caring going on here. I’ve got ideas, I told Laurie and George. Next up, was the tour of the barns and stables in the Club Car (from a golf club) with George. He built many of the animal residences. I fed the pigs and looked all around for Charlotte’s web. 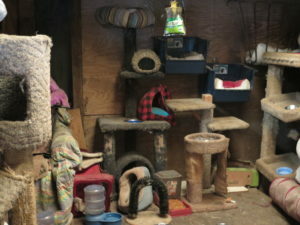 George showed me the barn with the cat houses; I took a few pictures leaving the innuendo outside. There was probably a dozen cat sleeping quarters. Later, Laurie and I took a walk past a barn and a horse grazing. 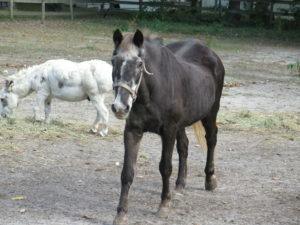 The horse was 45 years old and was peacefully living out a life. This kind of sums the experience up for me. The love and caring everywhere. Earlier, I fed a white horse, ‘Socks’ some bread. When I was writing notes, I felt a warm moist sensation on my arm. It was ‘Socks’ thanking (kissing) my arm. George, Laurie and I hugged again, vowing to get together much sooner than later. There is so much here that people need to know about. I love the mantra of NJ Discover; to elevate the people and places of New Jersey. And now we’ve done that to animals. 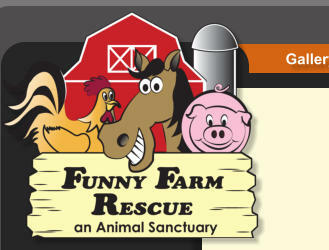 And please help out this non-profit. Everything, anything helps. And so it goes.